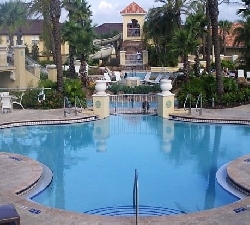 Come and enjoy your vacation at our 4 bedroom townhouse on the superb Regal Palms Resort & Spa in Orlando. Regal Palms is situated adjacent to the beautiful 18-hole par 72 Golf course at Highlands Reserve on the popular highway 27. 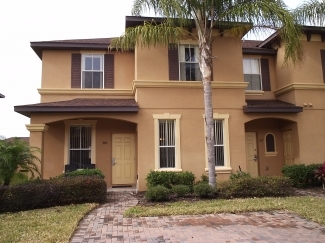 It is centrally located within easy reach of both the US- 192 and the I-4, with Disney being less than 15 minutes away. Situated behind berry Town centre, just a 5 minute stroll from the villa, with its selection of restaurants, shops and bars and a publix supermarket make it a perfect vacation destination. Sarasvilla is one of the largest on the resort with over 1800 sq ft of living space. It is situated within phase one only minutes from the pool. The Front terrace has been fully tiled and with an east facing aspect enjoys early morning sunshine.The West facing terrace at the rear which is also fully tiled is bathed in sunshine and a lovely place to sit back and chill. Our well-appointed townhouse offers spacious, comfortable and convenient accomodation with all the extras that you deserve to enjoy your vacation. 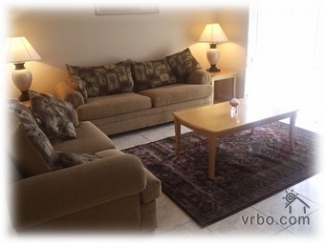 It Offers you the spaciousness and privacy of four bedrooms and three full baths. But unlike a pool home, our townhouse is part of a comprehensive resort with a hotel-class pool complex � as well as on-site clubhouse, gym, day spa, Internet caf�, and game room. And the Regal Palms Resort and Spa restaurant is getting rave reviews from guests. Our Villa is only a couple of minutes walk from the Pool and Clubhouse. Choose regal palms and you will truly have a fabulous time. you'll have to literally drag the children away from the pool..
We adore our Floridian home and take great care in keeping it in tip top condition. We annually carry out maintenance and updates to ensure it is of the standard you deserve.. We know you will not be disappointed..
**When comparing rates please note that this house is the largest model, is only minutes from the pool and has free high speed internet access.